Legislators in a USA state have announced their support to a new bill that will replace the current net metering policy for small solar plants. Maine may soon have a standard metering scheme instead of the current one, which has fluctuating prices. The new bill will incentivise solar plant installation in Maine. It is estimated to yield a ten-fold increase in the amount of solar power in the state and triple its solar workforce by adding around 800 new jobs. Net metering is a widely used energy metering system for rooftop solar PV plants, in which the energy generated by the plant will be partially consumed by the user and the remaining power is exported into electric grid through the existing connections. At the month end, the owner of the rooftop plant will be billed less by the utility in accordance to the amount of energy exported into the grid. However, in the current scheme, price of the exported energy fluctuates depending on its utility, making the profit uncertain. In the new bill, instead of fluctuating electricity price, the residential and small business customers (capacity less than 250 kW) would be compensated at a set price in a 20-year contract for net solar energy exports. The contract price would be set by the Public Utilities Commission (PUC) at a level high enough to meet the installation targets. Maine’s current solar installation is 18 megawatt (MW). 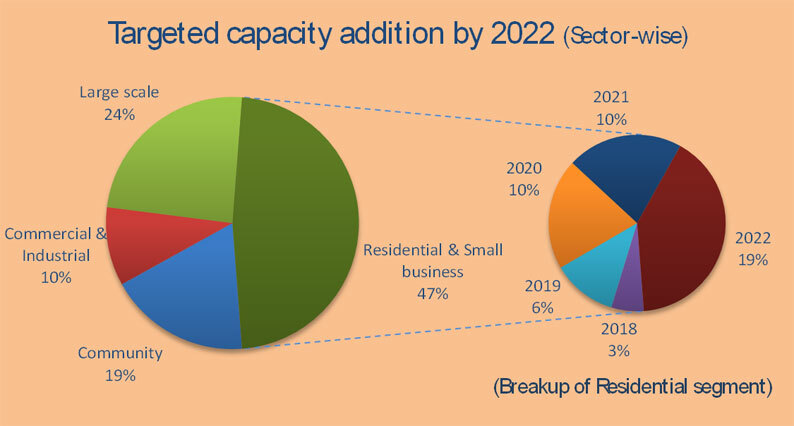 The state hopes to add at least 248 MW by 2022 in four sectors after the bill was passed. Once the new scheme comes into effect, the net metering would be available for new customers. The existing net metering customers would be able to choose between opting into the new program or staying in the current net-metering policy up to 12 years after the new scheme takes effect. The bill would dramatically expand solar power and solar jobs in Maine. It is expected to yield a ten-fold increase in the amount of solar power in Maine and triple Maine’s solar workforce by adding around 800 new jobs.